I called Andy and Melissa this morning to see about shooting Max either today or Friday (my two available days this week). Melissa said that Max has been in a lot of pain and sleeping pretty much all day (not sure if due to the pain, medications or what). They had originally planned to go to the Aviation Museum this afternoon but decided not to, because of Max's fatigue and increased pain level. So the options were...shoot today, which was going to be spent at home, or shoot Friday, when a quick bolus of chemo is scheduled. After talking a couple times this morning, we decided that I would just come to the house today and if Max was sleeping, well then...I would shoot him sleeping. That's what this is all about. We really never know. Whatever happens on the day that I'm shooting...happens. I arrived about 3 PM and Max was still sleeping. I saw Andy hook Max up (to his g-tube). No big deal was made. Andy just quietly did it. I'm sure it was a regular part of the everyday for him but for me, it wasn't. 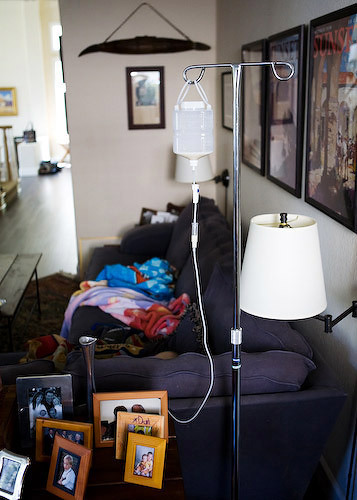 It struck me--this IV pole, which holds the daily nutrients that help keep Max alive, has become a standard piece of their living room furniture. Little Nicky, who I think has come to really like me, joined in on the photo shoot. Max, sleeping there on the couch, in the distance, didn't budge. 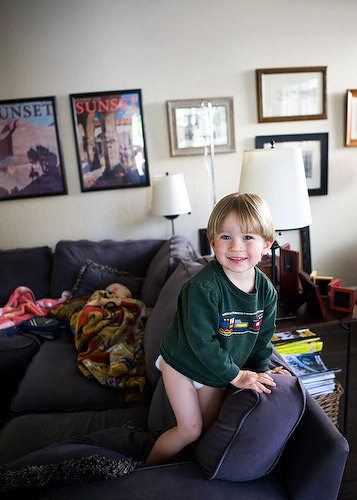 About 20 minutes after I arrived, Andy told me that Max woke up and was in the play room. It took him a bit to wake up but soon, he and Nicky were playing (well really, Max was tickling Nicky). Andy was telling Max to be careful when tickling Nicky. Me...I kept thinking about Nicky being careful not to hurt Max. As an outsider, I find myself very cautious of Max's every move, always asking him if he's okay...if this or that hurts. Maybe this will change with time, as I get to know Max and his family more. But for the moment, it's hard not to be (over) protective of (and with) him. I so adore the hint of Andy's face showing here, watching his boys goof around. Then, carrying a large book, Max asked me to come with him. I gladly did. He started swapping out the kitchen chairs and said, sit next to me. I'm getting you this chair...a comfy one. OH MY GOSH...are you kidding me. You're swapping out chairs so I can sit next to you, in a comfy chair. Ummmm...okay. I'll sit here all night if you want me to. If you didn't know the type of kid Max is...now you do! And then it was time for medicine. Three pills and a cup of juice set on the table by Mom. With a little grimace, Max takes them. Not exactly happy about it but part of the every day. Without a problem, he downs each pill...one by one. After checking out WWII planes and taking his medicine, we decide to go do his favorite thing--play video games. I was excited to watch Max do something he loves so much. But what i didn't know and wasn't really prepared for, was that Max can't walk up the stairs on his own right now because of his pain in his legs. He asked his Mom for help. Melissa asked him if he wanted her to carry him. He didn't. He just needed a little help. My eyes welled with tears as i watched. 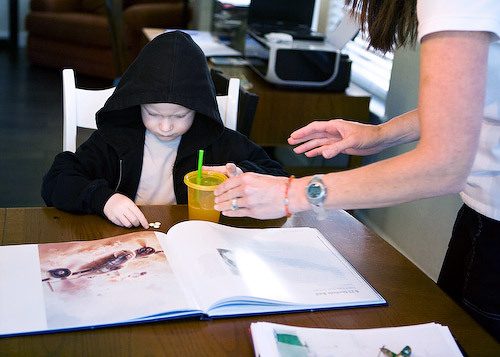 This is the reality of what this disease is doing to Max's little body. Playing his video game. Yes, I just love how max sticks his tongue out when he concentrates...just as he did at school. This shot makes me melt...pure, beautiful and innocent. 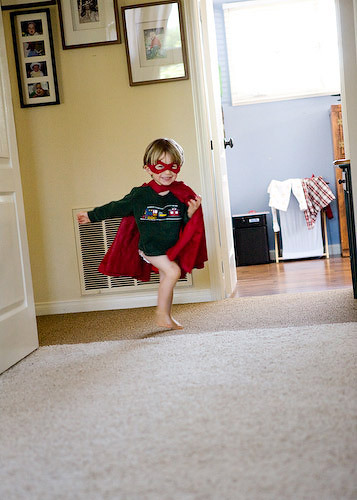 in comes super hero Nicky. He is absolutely adorable. And he so loves his big brother. Max wasn't very happy when Mom told him that he had to stop playing his video game. So in went a movie, the three sat on the couch together (well, kind of) and my time was done. Okay, that's enough pictures for today, Max said. Wow, Deb, your pictures and words bring tears to my eyes. 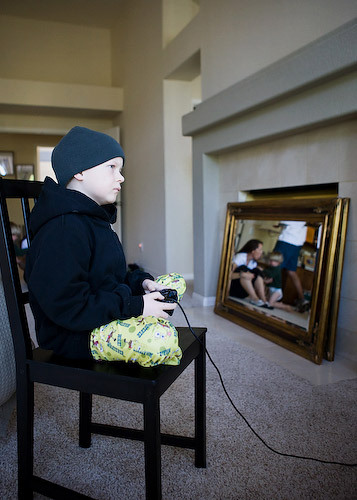 What a brave little boy and such an amazing family. I was introduced to Max and your site by the Lacey Family. Your work is absolutely amazing..."thank you" to you and the Mikulak Family for sharing Max with complete strangers who are falling head over heels for this little boy. I pray that Max's pain is reduced as he combats this terrible disease. 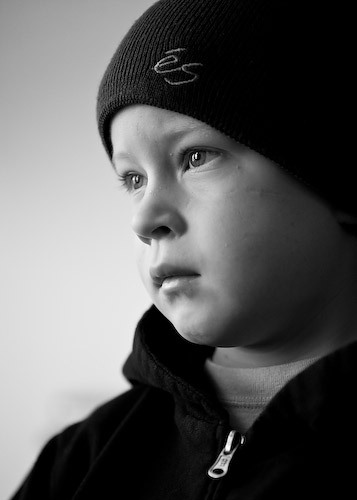 I have bin following max for awile now and I realy love the pictures, Max is a beautiful child and you capture him in a way thats totaly unique. Thanxs! beautiful and real captures of this wonderful, special guy and his family. I feel so blessed to have been able to meet max last week. your documentation of his fight is so moving and inspiring. I'm just a random photographer who was directed to your site. I don't even have the words to express how powerful your images are and how they have impacted me. 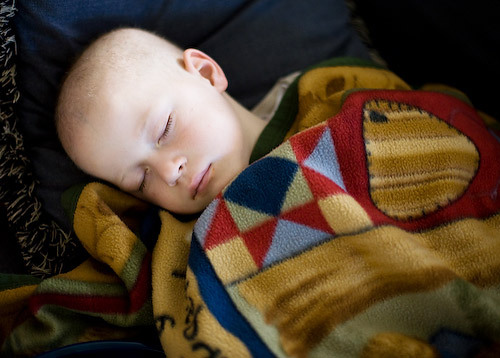 I have tears streaming down my face as I view these images and read about his life and fight against cancer. Bless you for the work you are doing for these families. Max and his family are in my prayers. What a brave little boy! This is definitely not a website to look at while at work! Makes it a bit difficult to answer the phone while trying to hold back tears. Its so heartbreaking and so inspiring and so real. These images, Im sure, are and will be priceless for this family. Thank you such a humbling and inspiring website.